Filed to: Skylanders.Filed to: Skylanders. Adding land, sea and air vehicles to the mix gives this fall’s Skylanders game an exciting new twist. More importantly, it gives children toys they can actually play with. 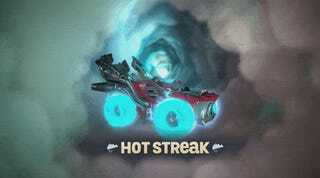 This is Hot Streak. It’s one of the 20 vehicles being introduced in Skylanders: Superchargers this September. Like previous Skylanders figures, Hot Streak will be placed upon a portal, allowing players to take control of it in the game. Unlike previous Skylanders figures, it doesn’t have a base—just rolling wheels. With these rolling wheels one can play with Hot Streak unlike any Skylander toy before, rolling it across the floor, making it jump sofa cushions, speeding it up one’s arm. I know this because that’s what I was doing with the toy from the moment it was handing to me at a recent meeting to check out Skylanders: Superchargers. Inarticulate figures glued to plastic bases are fine. Half of the 40 new toys coming out for Superchargers are just that, and they’re lovely. But as wonderful as they are to look at, they’re about as fun to play with as painted rocks. ...well, it’s got no action features, but you can fly it through the air making zooming noises. Either way, it’s all more play that the Skylanders series has ever known before. Along with these three initial vehicles we’ll see tanks, biplanes, helicopters, hovercraft—I mean, a child never forgets their first hovercraft. There’ll be no re-releasing of older figures in new poses. Instead, we’ll get some completely revamped versions of fan favorites, like Super Shot Stealth Elf. A new look, and completely new skills and powers to go along with it. She’s an all-new kind of awesome. As you can see in the clip above, core gameplay remains the same, though developer Vicarious Visions is mixing things up with some fresh new puzzles, a revamped Skystones card game, and some gorgeous visual effects. Check out the volumetric clouds in the video below. From what I saw during the preview, Skylanders remains one of the last bastions of mainstream 3D platforming, and as much as I enjoy the Toys For Bob-developed installments of the series, Vicarious Visions just does it a little bit better. Another thing Vicarious Visions does well is travel-based powers, as demonstrated in Skylanders: Swap Force. Consider the vehicles in Superchargers a massive expansion of that idea. Players put both a Skylander and a vehicle on their Portal of Power—Superchargers will be backwards compatible with older Portals, offering a lower-priced Portal Owner’s Pack for the first time in years. Throughout the game players will come across special vehicle spawning spots. Should their vehicle type (land, water, air) correspond with their toy, it’s magic time. Here are some examples of the vehicle-based play we can expect to see. Pretty sleek, right? And did you notice how the game paused in mid-session and swapped out parts on the fly? Each vehicle has a wide variety of bits that can be unlocked, bestowing special powers and abilities. And should your vehicle and Skylander match up—there’s one vehicle for each figure—this happens. Ultimate mode activated! So much fun. Here’s a little watersports, for those so inclined. And here’s some air racing. Mind you these aren’t the only sorts of course the vehicles will activate. One air level might be like something you see here, the next could be a side-scrolling shooter. Another submarine level may see the player exploring underwater caves. What floors me is these vehicle sections (except for some of the car stuff—it does come in the starter pack) are optional to progress. Defeating the water boss in the video above deactivates a few traps you’d otherwise have to dodge, but players can skip it entirely if they wish. Vicarious Visions is layering worlds on top of their worlds for these vehicles. It’s mighty impressive. As always, all previously released toys will work in Skylanders: Superchargers, but with this high level of focus on these particular pairings, I can’t see much of a reason to pull them off the shelf aside from achievements and whatnot. Trapped villains from Skylanders: Trap Team will not be summonable in the game, instead unlocking special stones for the Skystones side game. Skylanders: Superchargers is due out on September 20 for Xbox 360, Xbox One, PS3, PS4, and Wii U, with the 3DS and regular Wii getting their own separate experience. Owners of previous Skylanders games will be able to purchase a digital starter pack and use their existing portal to play. I am looking forward to my children losing Skylanders: Superchargers vehicles all over my home. This might be the year they finally do something with the toys other than chew on them.